there, so my water quality isn't a problem... again... I breed true percs.So my wife bought one... and it hasn't been doing well (thought it was due to quick acclimation)... so I went and bought another... did a 3 hour acclimation... brought it home in an ice chest...bought two gbtas with it...-I want my mama percula to imprint on rose and regular so the babies will take to both. at least that was my plan-Well... today, after waking up to the three new anemones looking perfectly happy... ... this first Sherman is still showing the same symptoms:-tentacles sticking together, sticking to algae, bacteria.-overly frequent defecation of body-colored bits.-enarging at night with mouth open-color fading, turning white in some spots, brown in others-as sensitive to hands in the tank as a ritteri(whereas most btas, you can touch and they don't care, this one shrivels when I pull have a finger in without vinegar soaking, and even then, its only a matter of time)-and now, today... a green tentacle. just the one? A single green nub, surrounded by pink and purple... cant really see it well in the photo, but I tried. one green tentacle...for now...but the bleached areas seem to be showing a little green, as well.i will more closely document the progress of the other, formerly identical, specimen, and post progress on my YouTube channel, The Lost Begotten. 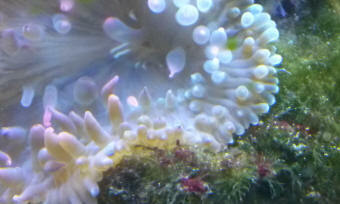 Feel free to check it out ;)-also filming an ultimate anemone guide series, so you may find that helpful. In addition to my 30yrs exp, this past weeks panic has made me update my research-base, and I feel like I've got some complete info that needs sharing. For now, I had to let you all know about this, apparently, dyed RBTA... makes me wonder if Sherman's are all dyed. It would be sad, but not surprising, if con-artistry had become so elaborate. I went and bought a Ritteri Anemone recently. I put it in the tank, and it immediately adjusted to the new environment. No problems at all. It eventually adhered itself to the glass of the tank. and it's insides were showing. That white stringy stuff? Anyway, it kept getting worse, and the half of the anemone was deflated. Now, as I am getting home from school, I notice that it is no longer on the glass, but on the sand in a pile. Not inflated at all now. I triple tested my water, and it all looks fine. and I am going to pull it out as soon as it starts to smell and decay. If you have any suggestions on what to do with the anemone, please let me know ASAP. I need to know how to proceed. Photo is attached. 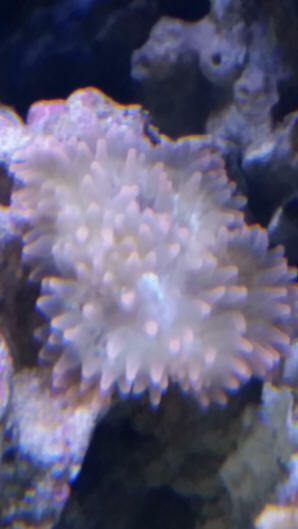 I am writing in order to see if I could get some guidance/help regarding mi bubble tip anemone. I currently have a Boyu TL550, 130 lt, saltwater aquarium. I placed my E. quadricolor 3.5 months ago, and for the first 2 months she did great (I am attaching a picture from when she looked healthy). Ocellaris clownfish, the female resided in the anemone, the male resided in an Euphyllia. 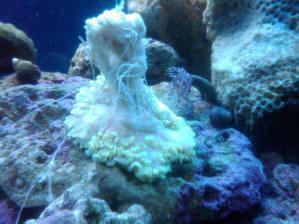 Now they have both moved to the Euphyllia, however the female goes back to the anemone any time she exposes her tentacles. I have never fed the anemone, except for 2 weeks ago (she was already looking shady) with a mix of brine shrimp and saltwater and squirted it; there was no change. (they are pretty steady). I recently got more parameters, and the only parameter that was not right was nitrate (20 ppm). Nitrite, ammonia, phosphate, calcium, dKH were ok. The rest of the aquarium looks fine (other residents are Rhodactis, Kenya tree, Parazoanthus gracilis, 2 Ocellaris, Sixline wrasse yellow watchman goby, Salarias fasciatus, 3 hermit crabs, 3 snails, 1 Lysmata amboinensis). If you could guide me in this issue I would be most appreciative. Hi there. I need help...About 1.5 months ago I moved to from San Francisco to Monterey for a job, and moved my 24 gallon reef tank for the second time in 2 years. My tank has been established since Oct. 2013, and has been thriving up until this move. Fast forward two weeks and I started to get brown slimy/hairy algae on sand, rocks, back walls etc. but wouldn't I see a noticeable uptick in nitrates? The tap water here smells very chlorine-y also, but shouldn't my RO system be filtering bad stuff out? My underlying question is; what could be simultaneously causing this algae outbreak and also stressing the anemone? Are there additional tests I can run to find out? Here are some details about my tank: As mentioned 24 gallons, all-in-one setup with Tunze 9002 protein skimmer, heater, power head, and bag of MarineLand activated carbon dropped in back chamber every couple months. Livestock: percula clown, royal gramma, Longnose Hawkfish, Banggai cardinal. A couple hermits, a couple turban snails, 1 fighting conch, 1 tuxedo urchin, 1 skunk cleaner shrimp. Soft corals (Christmas tree, various mushrooms, Zoas, leather), a few LPS (plate coral, hammer, torch, war coral). Levels: Nitrates, ammonia, nitrites all "0"
, pH 8.1, temp 78. I can measure for calcium and dKH but generally don't. I used to dose iron but don't anymore. and am desperate for a concrete way to put a stop to it. 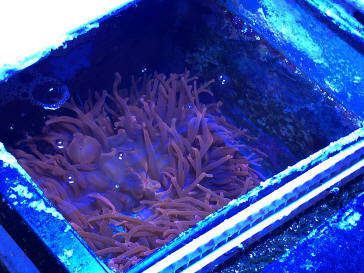 I have also attached a picture of the anemone spawn, and anem pics before and after move. Let me know if you need additional info to assess the problem. Thanks in advance for your attention on this. Apologies. I thought the pics were small enough, thanks for responding anyway. I will replace my sandbed...are you able to make a recommendation on live sand? And yes, I have tested "0" Nitrate for the past year and a half...I just figured my bioload was low enough or that I had a super effective bio filter. I will get a new kit. Bought this anemone on Friday. foot when in the bag, but (embarrassingly) didn't give it much attention. Here's the real kicker: To make matters worse, later in the day it started expelling smoky poofs... from the hole in it's foot! I got totally spooked & pulled it from the tank. It's in a simple container right now & I'm doing frequent water replacements from the main tank water. The hole in the foot has "clean" almost-symmetric edging....?? Hm, is this some spawning/splitting thing happening? foot ~2-3" & head/tents ~6"+)... but I have trouble imagining anything good when something's coming out the FOOT instead of the mouth. Help! Is there a way to save him? Or, is he splitting & I'm fearful out of ignorance of this process? Thanks in advance for ANY insight. PS - General parameters good. pH 8.1; kH 9; Ca 400; T 77F; SG 1.023; NO2 0; NO3 < 2; PO4 = 0. Fish, crab, snails, corals, etc are all doing well. but they are > 1hr away. Not an option right now, so I'm trying to treat or care for him as best I can. He did die late that night as expected. 220 Reef tank. Kessil 360 W lights .1025 sal. Good parameters light bio load on fish. I had a Sebae anemone in the tank with 1 rose bubble tip. All things fine. Doing 30 gallon water changes every 3-4 weeks. The bubble tip spit about a month after I brought it home. The clone located just a few inches away. About a month ago the Sebae started to look less than it should have so it was moved to a separate system. and after a couple of days moved away into a crevice and is shriveled up. This should not have happened but it had the appearance of such . The other bubble tip is looking like business as usual. I think my problems may have started when about 3-4 weeks ago I introduced 2 small mini carpet anemones. I have removed one that was easily taken but the remaining one about 2.5 inches across is too well attached so for now it will remain and I am going to run some carbon. 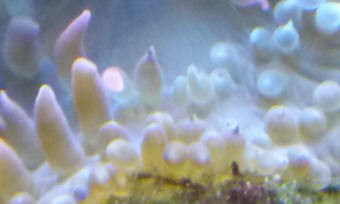 There is a fairly sizeable Toadstool coral in the tank also but about 2.5 feet from the bubble tips however I'm running a Tunze Wave box so the circulation may be getting an issue with chemical war fare going which is what I suspect. Yeah I know corals and anemones do not mix but I thought the size of the system would help to dilute such issues. Comments from the crew for anything I may have missed other than not doing my due diligence on compatibility. Hey guys, just wanted to send a quick note to you guys and thank you for your website. I recently ran into an issue however and wanted to share my experience. So first off some background about my tank. The camera I had been using had the flash turned off from the last time I used it. I turned it back on and took another picture of it with the blue turned down to 10%. 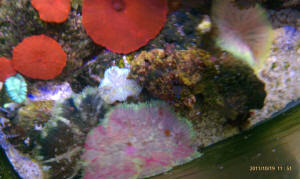 The second picture shows the actual anemones coloration and overall health. The blue and white mix lighting each at 100% was playing games with my camera's color saturation and was skewing my viewpoint of the anemone, and apparently everyone else's as well. So there really never was anything wrong with my anemone at all. I allowed myself to be fooled by the camera and my own eyes inability to properly discern the anemones true coloration due to the over saturation of certain wavelengths of light being emitted by the blue in my lighting. first question I will ask if I am ever trying to help is, was the flash on your camera turned on when you took the picture? What percentage of blue was your lighting set to when the picture was taken. Have a great day... Keep up the good work with the site. 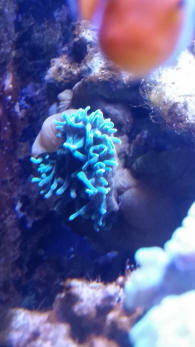 I have a quick question about a green bubble tip anemone that was sold to me by the lfs. I never seen one with a green base on the outside. It is a bubble tip or something else. Enclosed the pic of the chartreuse side. Thank you. 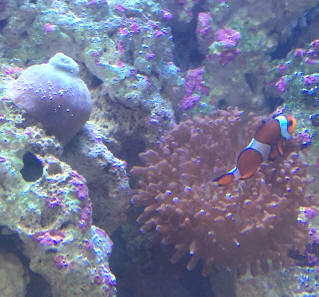 My husband and I bought two clown fish and a purple tipped anemone 5 days ago. once ever now and then. I've checked all the water parameters they are within normal limits, did a five percent water change. These are the only things in the tank besides some snails and crabs. And last question is this a wound on the bottom of its foot? 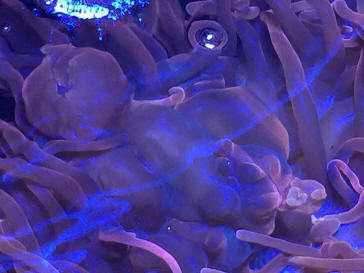 From what someone is telling me is it sounds like all of this plus that fact that it is bleached is going to be fatal to my anemone, is that true? If not does anyone have any information for how I can try to nurse it back to health? This morning we woke up to find our purple LTA (Violet) stuck to the front grill of a power head (1500GPH). After shutting off the power head and lowering her and the power head to the sand bed, we saw part of her pedal had been sucked through a couple slots in the power head grill. Initially, there did not look to be any trauma to her pedal or tentacles although she was no longer "sticky". Her pedal was stuck through the slits and swollen up on the other side with no way to pull her out without damaging her pedal. After waiting without success for several hours for her to deflate and extract herself, we observed that she was getting less responsive and we needed to do something quickly. We used some snips to carefully cut away the detachable front grill of the power head and was able to free her. We then noticed a shallow (<1/8") tear along the side of her foot about 1/2" long. 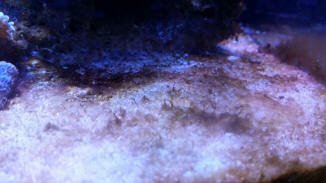 We set her on the sand bed and although she looks good physically (besides the tear, she is well inflated), she doesn't seem to be attaching to anything instead, rolling back and forth across the 4' aquarium over everything (LPS corals) on the sand bed. We reduced the flow of the power heads (which are now shielded with stockings!) and cordoned off the right hand side of the tank for her with egg crate and moved the other corals on the sand bed to the other side. Hopefully, you will agree this was a good idea (?). All tank parameters are stable (SG=1.026, pH=8.18, Ca=420, Alk=9, Temp=78.8, N's=0, Po=0). She has always been pretty good about keeping put and I believe the reason why she ran in the first place was because the hose in our Kalk/ATO was on the bottom of the bucket (woops. )and probably sucked in some of the residual sediment and blew it into the tank during the nightly dosing. Is this a reasonable explanation? The power heads and ATO have been fixed to prevent issues like this from occurring again. Is there anything in particular we can do to nurse her back to health? When can we expect her to be back to normal (eating, attached, etc. ), assuming she survives? Is there anything we need to watch out for physically? Thanks for any suggestions you may have. much appreciated! 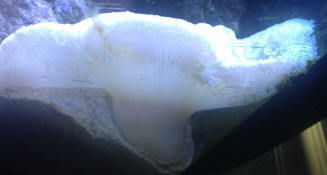 I ordered a Haddoni Carpet Anemone from Liveaquaria. It arrived yesterday and I am concerned that it may be bleached. It is very light green. It seems to be very healthy. It is very sticky and quickly buried it's foot deeply in the sand. I have always had such a good result with all live stock ordered from them. Should I be concerned or is it possibly the natural color? Wow!!!!! Talk about customer service, and from a volunteer site! Will let you know the outcome. My name is Kevin Kohen and I am the LiveAquaria.com director for Drs. Foster and Smith. I am very sorry to see that you experienced a problem with your recent LiveAquaria order number A2937672, as this is not the level of service that you deserve. I have reached out this morning to the staff in California and sent along the image you had provided on WetWebMedia.com so that we can ensure that we take the proper steps to correct the problem. 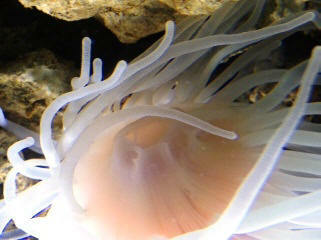 The anemone you received is definitely far too translucent and bleached, as its expelled most of its Zooxanthellae. Please keep the anemone illuminated well and offer food in the form of large Mysis, chunks of krill or other meaty foods several times per week and hopefully it will regain its beneficial algae. This may take up to 6 weeks, but from the sounds of it, the anemone has the ability to capture food and adheres to a solid surface so that is a great sign. 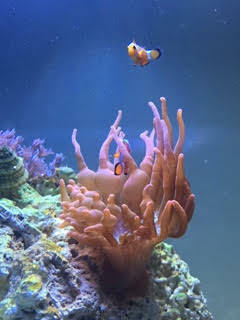 I have instructed our LiveAquaria.com staff to provide a refund back to your credit card which was used to make the purchase for both the anemone and the next day air Saturday shipping charge. You should see this on your credit card statement in the next 72 hours. Once again, this is not the level of service nor the quality of animals that we are known for, and I am sorry for the problems associated with your order. We truly value you as a customer and sincerely appreciate your patronage and support. If you have any further questions please feel free to reach out to me directly or to our customer service staff by calling 1-800-334-3699 . <Outstanding Kev; thank you for your prompt attention to this matter. Thank you very much for emailing me, I really appreciate it! <Kevin; your "A" efforts (Dr.s F & S) ARE the industry's exemplary standard. Am glad to bring occasional/anomalous events to your attention. food. Any other hints you may have would be appreciated. ago. As of now it is hanging down and it has transparent looking skin coming off of the feet. It's mouth is opened very wide and there are tentacles in the mouth as well. What's wrong with my anemone? i have a 220 watt in a 55 gallon tank. is that wattage good enough? What measures do i take to help my anemone? Please help. 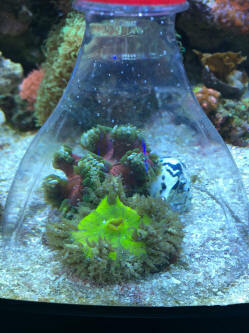 Last night one of my live rocks shifted and landed on my green long tentacle anemone. I quickly moved the rock once I realized it had happened. 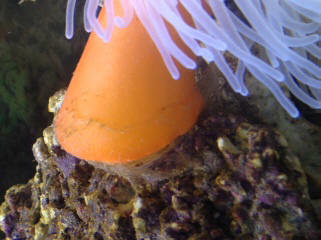 This morning I noticed that the anemone appears to have a tear on its column. Is there any way it can survive this, or is it doomed for death? Is there anything I can do to help it? Thanks! I have a concern about my anemone. and everything was fine in that department. I read on your site about feeding the anemone and I decided to buy some frozen krill. This is the only change that's happened this past week. I feed him every other day, stopped two days ago though because it was looking a bit sick (closed up, shrivel looking tentacles) I'm not sure was the problem is, for the 5-6 months I've had him, he's been great. Have you come across this problem with my type of anemone? Im continuing to look through out you site if I find an answer, but I thought I would ask up front too. Thanks for the advice. The only reason why I haven't started testing the water myself is because the fish store I go to is literally 5 minutes away. so Im doing a small water change today, will keep reading WWM, (maybe if I give it smaller pieces of krill???) and if anything changes I will seek out WWM for some helpful advice! Its a really beautiful anemone, I would hate to loose <lose> it! Hi, sorry about that! I had our water checked and they said our levels were perfect, I asked them and they said the anemone could not be getting enough light, so I added lamps. However its still about the same, only half of its tentacles are inflating, the ends stay deflated. Is there anything to do? Or just wait and see what happens? Also the color is fading. Hi Bob, thank you for being willing to share your expertise. system stays stable at ph-8.2(high buffering in my well water, NH3, NH4, NO2 all 0, have thriving corals under a power compact lighting and happy fish, except my clowns who have had to pine over several anemone losses. about fifteen minutes, put them where I think they'll like it and let them alone. They thrive and eat for around a week and begin to deteriorate, stop eating (which I don't fret about too much under lights), huddle up more, attract the attention of scavengers, and eventually definitely look like they are on they're way out(dropping bits of tissue or producing copious mucous), at which time I pull them, isolate them and none of them have made it out of quarantine. One developed a white patch (fluffy like a fungus might be or a bacterial infection) on its foot that spread very quickly. I have searched for information on anemone diseases and how to treat with no luck. Anyone have any ideas? I hate to label my tank unsafe for anemones. Thank you for your time...sorry to hear that...... and I will follow up on the links! The blue tip is thriving and eating so far! The clowns are starting to check it out...wish me luck. Thanks again.! 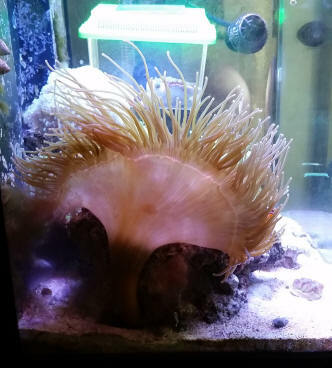 I purchased 3 maxi mini anemones from an online vendor. They arrived badly bleached. In 4 days they went from what you see in the picture to pure white. They respond to light. Whatever little color they came with, 4 days ago, has now left them. How can I nurse them back to health? Is it too late? They do not stick like the other maxi minis I have. My concern is that they're not able to eat. Disputing with the vendor is futile at this point. I also ordered a purple gorgonian from them that also arrived badly bleached. I've never seen anything like this. The gorgonian shed and has good polyp extension. I can see a hint of purple after 4 days. How do corals get like this? Is it too much dosing, not enough light?? What? I'm feeding oysterfeast, Phytofeast and frozen Cyclopeeze. I try to feed PE mysis but the anemones just won't hold on to them. I'm angry about this! 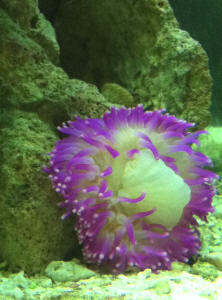 The photos attached are of the 3 anemones just 5 hours after they arrived. They are the 2 on the bottom left and one mid bottom right. All except the black/blue one are completely white at this point. The black/blue one is fading fast. The Corallimorph on the bottom of the rock was found when I lifted the rock. Not of major concern. I suppose whatever would help the anemones would also help the Corallimorph. I hate when vendors are so callous about these beauties. It's criminal! Thank you. I have many reference books. Which ones do you have in mind? The anger and frustration has passed. Now it's time to nurse them back to health, if possible. My apologies for not sending this initially. The gorgonian and anemones are in a 75 gallon mixed reef. I'm not a fan of exercises in futility or slim odds, but feel badly for these magnificent creatures. They deserve a chance. Will test PH again when the lights are on for a while longer and adjust accordingly. Phosphate - could be my test kit is off. Will test again. I've found that my corals respond well to Macrobacter7 and Restor; brighter colors and amazing polyp extension after dosing. Especially the LPS's. What mix do you recommend? Yes, I have Mr. Calfo's "Book of coral propagation". I also have "Reef Invertebrates" by You and Calfo as well as "The Conscientious Marine Aquarist" (fave book) by you. Have to search further to see if what I have by Borneman. I have many Marine aquarist and reef related books. 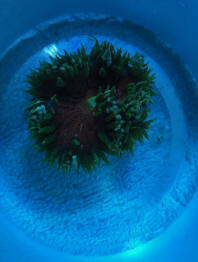 I just received my new green BTA yesterday afternoon from Blue Zoo Aquatics. I've always had great results with their livestock, so when I received my anemone, I was very hopeful. When I opened the bag after letting it float in my tank for about an hour, I immediately noticed a foul smell, and saw that the mouth was wide open and what looked like mesenteries we hanging out. I called Blue Zoo and explained <explained> this to them and they said to acclimate it as normal and to put it in the tank and see how it does overnight. Well, when I put it in, it immediately took hold of the rock I placed it on and became a bit larger in diameter, but stayed shriveled and continued pushing its "guts" out. 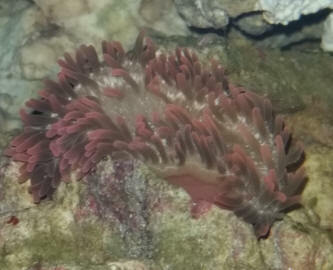 I read everything I could find on this with anemones, and all I could find was people talking about brown stuff and how the anemone will go back to normal after the lights come on and so forth, This one is not doing that. I've included a photo, but it looks like a nuclear mushroom cloud. That's the only way to describe it. Everything else in the tank seems to be doing well. You can see in the photo that my new feather duster is doing just fine. The photo was taken right around 0600 as I was getting up for work so I haven't had a chance to test the water yet, but plan to right away, but need to know what to do. Please help! Lighting is T5's and actinics.